In every community across the world, there are men and women who are willing to make a sacrifice. Let’s see a work of art that honors the courage of six leaders in France who were willing to give up their own lives in order to spare the lives of their fellow citizens. Many centuries ago (between the dates of 1337 and 1453), there was a war between the kingdoms of France and England called the Hundred Years’ War. During this war, an English king, King Edward III, surrounds Calais, a city in France, and for eleven months nearly starves its citizens. According to an early historian, the English king agrees to spare the city if and only if six of the town’s prominent citizens called burghers come out of the town: “bare-headed, barefooted, and bare-legged, and in their shirts, with halters about their necks, with the keys of the town and castle in their hands.” The English king intends to hang the six burghers to make them pay for their town killing many of his men during the war. Soon six rich and powerful burghers agree to surrender themselves to the English king. They agree to be punished. They march out, bound together by a rope around their necks. The English king’s pregnant wife sees the six burghers, is moved by their courage, and begs her husband to spare their lives. The French sculptor Auguste Rodin (1840-1917) worked on a monument of these men for many years. Here we have his first model for his much larger monument. Look closely and describe the men as a group. The men can be seen from all sides. Three figures face out from one side, one figure faces out at one end, and two others face out from the opposite side. The men are bound to one another by a sense of civic duty and fate. How has the artist shown this in his work? The six burghers are bound together physically by a rope around their necks. Look closely at their gestures, positions and expressions. Do you think the artist was successful in expressing their emotions? Did the artist show the burghers as willing to give up their own lives but at the same time fearing death? Describe each one individually. The figure on the left gestures inwardly with his right hand. His left arm rests on the shoulder of one of his companions. Is he questioning himself, perhaps? Is he overcome with emotion and unable to support his own weight? The next burgher holds onto the leader of the group, who extends his left arm out in front. To where is he pointing? Is he pointing to the way out of the city—to a freedom beyond his reach? The burgher next to him bends over and cradles his head in his hands. On the other side, two burghers grasp hands as if afraid to let each other go. What do you think? Are the men fearless heroes or fragile human beings afraid to die? “Do I have the strength to meet my fate?” each one seems to be asking himself. They are willing to make a sacrifice, but at the same time it seems their feet refuse to carry them any further. Would you be willing to make some sort of sacrifice to help your family and friends? If so, what would you give up? Take a moment to think about this. During the years that Rodin worked on his monument of these men, he separately modeled heads, hands and feet, torsos and complete figures, combining and recombining them until he was satisfied with his final composition. Let’s see one of his models for his monument. Here we have a model for the youngest burgher, Jean de Fiennes. Describe him. He appears to be moving forward, yet he gestures backward. Look at his hands. What emotions do they convey? His palms are open wide. It’s as if he has just cried out and given voice to his dispair. Is he accepting his fate? Has he given up all hope? He seems to be shocked that life can be so cruel—that life can be over when it has only just begun. But remember! The English king’s wife pleads on the six burghers behalf, and the king agrees to let the men go free. So this story has a happy ending! Would you like to see The Burghers of Calais and Jean de Fiennes in person? All you have to do is visit the North Carolina Museum of Art in Raleigh, North Carolina. 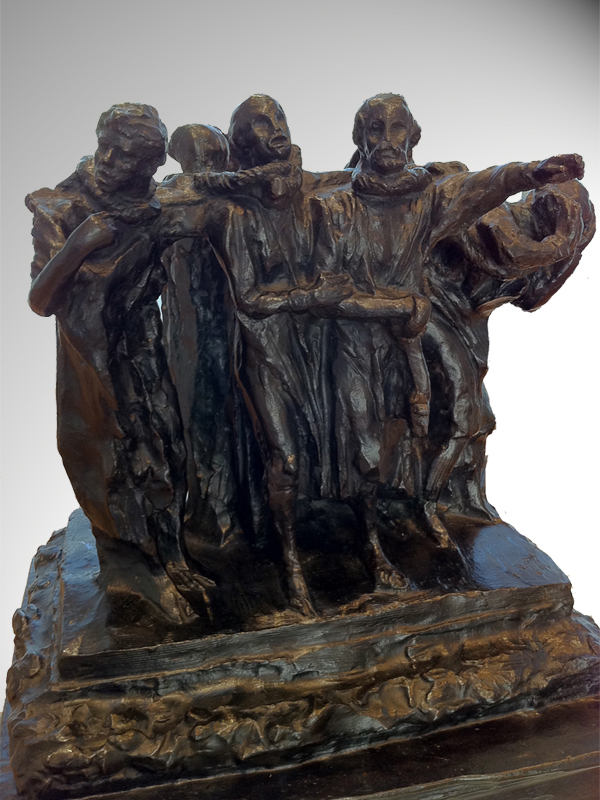 The Burghers of Calais and Jean de Fiennes are in the Rodin Court and Garden at the museum. Or perhaps you would like a tour. Tours of the collection are given daily, except for Monday when the museum is closed to the public. If you prefer, you can contact the museum ahead of time and arrange for you and your friends to have a private tour. I’m sure a docent at the museum would be happy to show you and your friends The Burghers of Calais and Jean de Fiennes and many other works of art. Whether you visit the museum on your own or have a tour with a docent, it will be well worth your time!